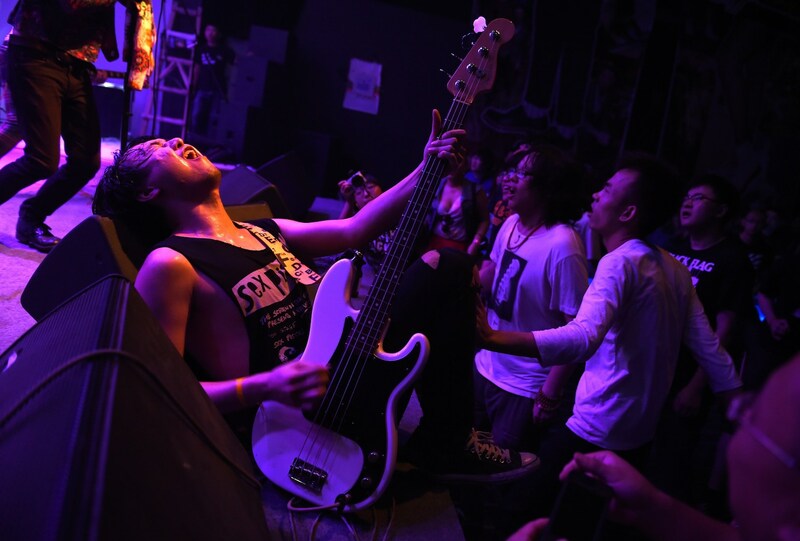 Bass player Zhang Yuhao of Henan band Pumpkins performing in front of fans during the Beijing Punk Festival in Beijing, August 30, 2014. Alec Ash, a young British writer who lives in Beijing, has covered “left-behind” children in Chinese villages, the “toughest high-school exam in the world,” and Internet live-streaming, among many other subjects. He is the author of Wish Lanterns, which the Financial Times called a “closely observed study of China’s millennials.” The book tells the stories of six Chinese people born between 1985 and 1990. The characters, who have very different backgrounds and aspirations, include a rock musician named Lucifer, an Internet addict named Snail, and a patriotic Chinese Communist Party official’s daughter. In this episode of the Sinica Podcast, Alec discusses his book with Kaiser, Jeremy, and David Moser. He talks about contemporary youth culture in China, the concerns of Chinese millennials, how he met the six characters in the book, and what we can understand about China’s changing culture from their stories.